Repair of complex ventral hernia presents a significant challenge plagued by high morbidity and recurrence. Recent studies have demonstrated significant benefits achievable with preoperative Botulinum Toxin A (BTA) chemical component paralysis to the abdominal wall muscles, facilitating primary closure of complex ventral hernia defects. However, transversus abdominis is known to play an integral role in truncal stability, and its paralysis can result in unwanted physiological changes. This is the first study to report on selective administration of preoperative BTA to internal and external oblique muscles only, thus sparing transversus abdominis from paralysis. 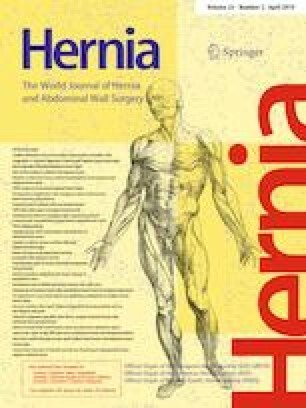 This is a prospective observational study of 46 patients who underwent either selective two-layer or standard three-layer abdominal wall muscle BTA injection prior to elective laparoscopic ventral hernia repair. Serial abdominal CT imaging was performed to compare defect size and length of the lateral abdominal musculature. 46 patients received preoperative BTA injections (23 in each group). A comparison of gains achieved from chemical component paralysis demonstrated no statistically significant difference between the two groups. Fascial closure was achieved in all cases, with no post-operative sequelae of abdominal hypertension. There are no hernia recurrences to date. Preoperative selective muscle chemical component paralysis is an effective technique to counteract the chronic muscle retraction observed in large ventral hernias. Transversus abdominis plays a significant role in truncal and spinal stability, and sparing it from paralysis preserves an important component of abdominal wall physiology and does not detract from the ability to primarily close complex defects. There are no sources of funding to disclose. All authors (KE, JS, PC, OR, AJ, RTM, and NI) declare no conflicts of interest, with the exception of JR, who declares conflict of interest related to the submitted work as he receives financial remuneration from Medicare as a radiologist.